More numbness or pain at night than during the day. The pain may be so bad it wakes you up. You may shake or rub your hand to get relief. Pain that increases when you use your hand or wrist more. Trouble gripping objects, such as a doorknob or the steering wheel of a car. Doing the same hand movements over and over can lead to carpal tunnel syndrome. It’s most common in people whose jobs require pinching or gripping with the wrist held bent. People at risk include people who use computers, carpenters, grocery checkers, assembly-line workers, meat packers, musicians and mechanics. Hobbies such as gardening, needlework, golfing and canoeing can sometimes bring on the symptoms. Your doctor may tap the inside of your wrist. You may feel pain or a sensation that feels like an electric shock. Your doctor may ask you to bend your wrist down for 1 minute to see if this causes symptoms. Your doctor may have you get a nerve conduction test or an electromyography (EMG) test to see whether the nerves and muscles in your arm and hand show the typical effects of carpal tunnel syndrome. Many products you can buy — such as wrist rests — are supposed to ease symptoms of carpal tunnel syndrome. No one has proven that these products really prevent wrist problems. Some people may have less pain and numbness after using these products, but other people may have increased pain and numbness. 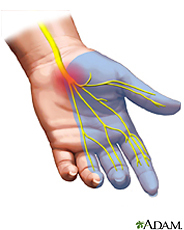 Get treatment for any disease you have that may cause carpal tunnel syndrome. If you do the same tasks over and over with your hands, try not to bend, extend or twist your hands for long periods of time. Don’t work with your arms too close or too far from your body. Don’t rest your wrists on hard surfaces for long periods of time. Switch hands during work tasks. Make sure the tools you use aren’t too big for your hands. Don’t sit or stand in the same position all day. Prop up your arm with pillows when you lie down. Avoid overusing the affected hand. Find a new way to use your hand by using a different tool. Try to use the unaffected hand more often. Avoid holding your wrists in a downward bent position for long periods of time.